Chae “Piglet” Gwang-jin is one of the most well-known marksman players in League. Having won the Season 3 World Championships on Korean team SK Telecom T1, he’s proved himself as one of the best in his role—now, he’s defining his position in a new lane. Earlier this week, Chae’s current squad Team Liquid confirmed the team would be moving him to the middle lane, bringing in Young-bin “Youngbin” Jung to play the marksman role. This move was made slightly out of necessity; Team Liquid was sitting at two wins and eight losses for the season, ranked ninth overall in the North American League Championship Series standings. The question was whether a famous marksman player, now struggling to carry the load for a North American squad, could make the switch to mid lane. 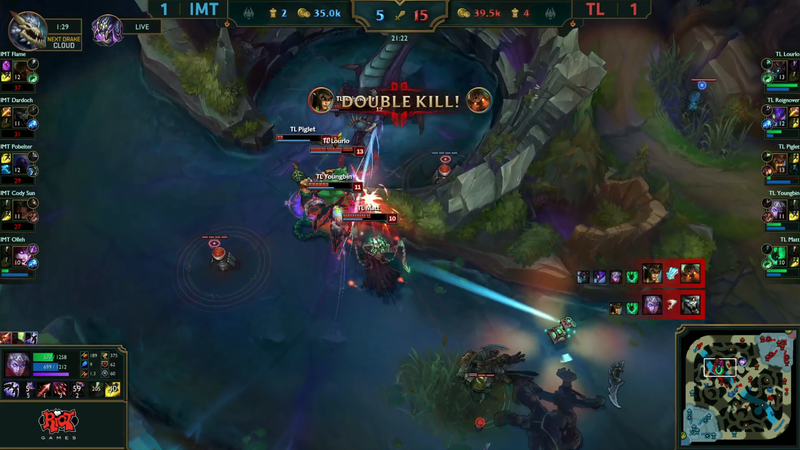 The results in Chae’s debut against Immortals yesterday speak for themselves. After a tough game one of the series on Ryze, where Young-bin’s Ezreal failed to take off for the team, Chae turned to an odd pick for game two: Ahri, the mobile assassin fox-girl. According to Oracle’s Elixir, Ahri has only been picked in five games so far across every region this season—for comparison, Ryze has been picked 130 times. Chae’s Ahri was effective at picking off members of Immortals, picking up five kills and 10 assists in Team Liquid’s victorious game two. Combined with Liquid’s jungler Kim “Reignover” Ui-jin, the two established a real threat. Game three would be the decider though, to solidify a win for Liquid and start the climb back up the rankings. In the final game of the series, Chae chose Cassiopeia, a Medusa-esque champion who uses poison and fangs to deal damage over a period of time. Her playstyle has often been compared to that of a marksman’s, where positioning correctly and outputting damage at a regular pace during frantic teamfights is key to playing her well. In a big fight, Chae showed his prowess at doing exactly that. Landing Cass’ ultimate “Stone Gaze” on a number of Immortals’ players, Chae slowly dismantled their eager initiation with a volley of poison. Seizing victory soon about 10 minutes after that fight, Team Liquid took the series 2-1, with Chae putting up an impressive 12 kills on Cassiopeia. This series may just be one anecdote, but it’s the start of a climb for Team Liquid. Now at three wins and eight losses, the team has four weeks (including the matches left in the current week) to make it into a playoff spot. Currently sitting at three wins behind fourth place, it’s not out of the realm of reality, but more performances like yesterday’s will be needed. In a post-game interview, when asked about whether Chae was a better midlaner than famous mid and former teammate Lee “Faker” Sang-hyeok, teammate Kim took over the mic to jokingly imply Chae was coming for Lee’s spot. He may not be another Faker yet, but “Midlet” fever has swept over the North American LCS, and Team Liquid’s last-ditch run for the playoffs will be a storyline to watch over the coming weeks.